JeezLouise. This guy. He’s clearly mad that Frederick County (belatedly joining the rest of Maryland) is also not going to be hiring its council persons to do their construction work. Airing his grievances like this happens to really get our knickers into knots. 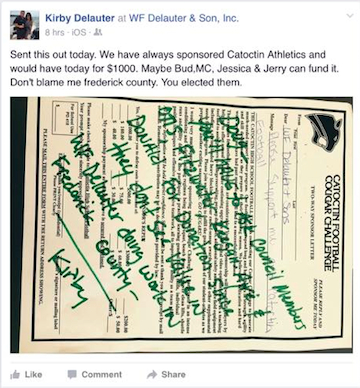 If his business was so dependent upon Frederick County in order to profit, the least he could have done was sincerely look for other donors to help Catoctin High School Athletics. Assuming a county school would be unlikely to get into a political brouhaha with a county council member, we will ask on his disgusting, self-serving behalf. Is anyone more despicable than this? Just gross. So hey, if you should find yourself in a position to be generous, consider sending some coin to the extra-curricular programs at our stretched-thin schools. Since this guy’s mad at some other council members, he’s taking it out on the students. Publicly. Because #kirbydelauter cannot learn from past mistakes. Oh, and if this is staged and did not actually affect the status of a donation–and it well could be–pretending to be stingy with kids because you’re mad at adults is just as bad, in that you still look like the same jerk. But dumber, because you want to show everyone you’re awful, and that is facepalm stupid. If you have specific contact information to process donations or promote fundraisers for student activities in Frederick County, please feel free to share in our social media contacts. Previous postSinging the praises of our friend Bud. Is KD implying that if he doesn’t get the government contracts he can no longer afford to give to charities?